I'll move my posts over here. Wouldn't work so much about "top heavy" even though it is. 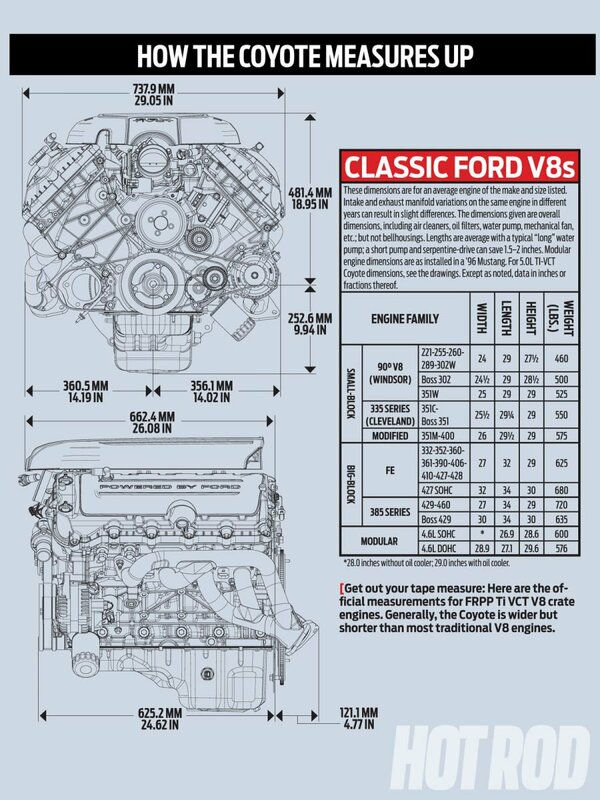 All DOHC engines will be like that as you can't put 4 cams and the associated phasers for VVT, direct inject pump, etc up there and not have the associated weight. The gains far outweigh the drawback in this case. My Voodoo (Coyote) will be the same way. 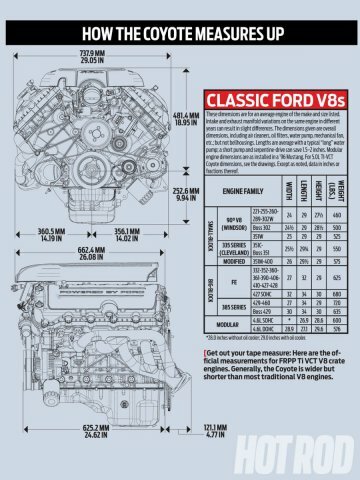 The "high feature" V6 will have an advantage if set as far back as you can in being so short you in essence have a front mid engine car. Again, I'm doing the same with my setup but the engine is longer. Calculations put #1 cylinder about centered on the strut (will be coilovers with SLA on my car) towers. That V6 should by fully behind. "Ok, these are rough numbers taken with a tape measure. Overall height from bottom of pan to top of the bump on the intake manifold: 30"
Width at heads: 23" Width at stock exhaust manifolds: 25"
Length from transmission mating flange to front of balancer: 20.5"
These are at the widest points." Same problem with height on the Voodoo/Coyote - too tall to clear the hood and it starts an inch shorter (maybe a little bit shorter less the covers). Stock form would nearly have the oil pan on the ground. Luckily there is a race pan available that gives the necessary clearance. Also, for what it's worth heads clear by 1" each side if centered. So the V6 will be golden that way. So, critical go/no go is height - if you start with a manual trans package assuming you want a manual. Solve that and you have to decide if it's what you want. The SIDI makes good bottom end torque from the high comoression. I drove an LLT Camaro and it felt like V8 car. Take 1500lbs off that and it will be impressive. Supercar power? - NO. No way that engine runs with my Voodoo or any of the higher output LS or equivalent cars. Fun to drive, high reving, potentially great handling, powerful car with great economy? - yes. Boils down to what you want. Like seattlejester and others mentioned it's not wise to use "best" anywhere at least in a general perspective. Might be the best choice for your goals - certainly not for mine. It will have an advantage again IMO in that the power delivery is more progressive which is one of the reasons I chose the Voodoo. That along with unique sound and high revving. VVT allows best of both worlds with high horsepower/RPM but still can cruise just off idle and not be loping.The LS family are awesome engines with massive torque down low - my Jeep feels like a big block on the bottom which is great for that application. Getting it to the ground in a 2500lb Z is another matter. I'm not so sure power to the ground will be very hard. to accomplish. It seems the lighter weight will allow the car to rocket off the corners with great torque and acceleration with proper throttle modulation. agree the engines were talking about can overpower these little cars, but I think the traction will be really good compared to the heavier more powerful cars. we're talking 1/3 less weight or potentially even more. In talking about "putting the power to the ground" I am referring to the torque from an LS. Ask any of the guys here with big power LS engines how they launch or road manners, just as likely to put it around a pole. A friend told me about his "it makes me a more religeous person to drive it. Scares the heck out of me...prayer in your heart..." I think the power delivery from the other engines is going to be more manageable as it builds more progressively. The easiest, most economical hp per dollar will be the LS - hands down no question. There is a reason it's so popular. From a practical standpoint I should be going that route. I've done it a bunch, have parts and a 6.8L (4" stroke VVT 6.2 LS) going back in my Jeep replacing a 6.2. 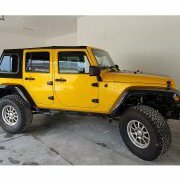 They are relatively inexpensive, package well, aluminum block versions are lightweight, big power per dollar, arguably best parts support, and the list goes on. But dealbreaker for me is RPM and delivery. You can't have it both ways with an LS either it revs and open up your wallet with the 8200rpm a crazy high goal and completely give up any hope of a low RPM cruise (cam will lope down low). Or you can have than insane torque delivery I love in the Jeep but more truck/big block delivery which is hard to put down in a 2500lb car even with the VVT which I have and goodbye revs (power is still there and likely even higher just not stratosphere RPM). The VQ37VHR would be cool. It should fit well but I haven't been down that road so not sure what obstacles might be there. It's a Nissan so "in the family" if that's important to you. Power is going to be a little lacking compared to the other choices unless you boost it. Cost will be higher. Transmission will likely need to be stock 370Z for better or worse. Sound will be cool, power deliver will be progressive, should be pretty lightweight and it should rev - all mportant factors to me in a sports car. HPTuners now supports the Nissans so that fixes one major obstacle. 69Honda is using a built Nissan V8/T56 but I forget which version. Otherwise our cars are pretty similar and we're working together on a lot of the parts including the Super 8.8 rear and T56. The Nissan V8 is going to be crazy fast. Voodoo/Coyote is a tight fit both height and width - width is 2" less than the towers at the heads and that race pan will be a must have. T56 is a pretty easy bolt up and I have a wide ratio Magnum along with the aluminum bellhousing ready and waiting. Flywheel and clutch might be a challenge on the Voodoo (stock is dual mass unique design) but easy on the Coyote. Voodoo a little lighter than LS3 and Coyote a little heavier but we're talking 10-15lbs ish either way. Both have more progressive power delivery and naturally higher RPM because of DOHC and true dual VVT again Voodoo more extreme both ways. Sound is a bit subjective but I don't know how anyone can argue with the flat plane crank "brap", it's just insane. But a properly exhausted Coyote, maybe a bit cammed with some compression sounds downright mean. The new GT Coyote engine makes more torque and in a Mustang is quicker 60ft and quarter. Voodoo goes through the quarter traps higher mph with a slower time - can't get the heavy Mustang moving but catches it and surpasses after that initial takeoff but not enough to pass in 1/4. That might change less 1500lbs in the Z but maybe not as properly setup you might get the Coyote torque to the ground and if you do Coyote will be the faster car. Coyote will be half the price and not even close easier to find. Parts much more available (though not as easy as the LS) with some crossover but not all. Both are really unique installs in the Z. I know of one Coyote and mine will be the first Voodoo unless someone else beats me to it which is possible as my project is moving SLOOOW. For me the Voodoo is "best". You'll have to answer that question for you. If you want unique or some of the other "advantages" by all means pursue different. But, if you're not up for all the extra hurdles, money, and time, put an LS in there! You'll likely be fabricating pretty much everything on the unique swaps where the LS has kits available and more support if you have questions or WHEN you hit snags. There's a reason they are the most popular and generally "best" swap. There, used the b-word several times in there - hopefully with enough qualifications to get away with it. BTW, I think the high feature V6 could be made to fit. Possibly open up the hood or carefully fab an oil pan or maybe one of the applications now has a low profile version. Mine was out of a 2008 CTS RWD manual for what it's worth. Impossible is like that best word and shouldn't usually be used. Depends on how bad you want it. So that does make me think about the 370Z, VQ37VHR engine. I believe that engine weighs 320 lbs. Not sure how the trans for that engine compares to the weight of theT56. My guess is it is lighter. This leaves me in a quandary as to take the project the easy way and go with the LS, or stay the course with a light weight goal. My conscience wont let me buy or use a Coyote engine. May sound childish but I have my reasons. terrible shame my conscience controls that, because it is by far the best sounding engine on the market today. The only engine sound that rivals it for sound is the ferrari. After alot of contemplation over this 280 build and which engine to use, I think I've decided to go with a Nissan SR20DET engine. I really want to concentrate on weight savings. After all teh power adders on the SR20, its weight will be a little above the VQ37 engine but it will have more power. The trans for the SR20 is considerably lighter and smaller than the VQ trans. I was hoping to stay NA for a track car but I'll go turbo and just learn how to drive it and keep it in the high rev zone. Any insight is appreciated.